Walk around checks are more than just ticking boxes before you drive off. They are an essential part of the maintenance process, spotting issues before they prove bigger, more expensive problems. It is also about safety on the roads. It saves lives. However, how can you ensure your drivers are doing these checks properly? You cannot watch them all the time, so CheckedSafe has released an app designed to ensure just that. Chris Peat spoke to CheckedSafe Director and former operator, Gary Hawthorne, to find out more. Gary said the app is designed to be simplistic to use. Once a driver has opened it on a smartphone or other mobile device, the registration number of the vehicle about to be driven is entered. The type of check required is selected and users can then go through each of the check points (such as lights/indicators, brakes and tyres, etc), pressing the ‘pass’ or ‘fail’ option for each one. If a ‘fail’ option is selected, then a screen pops up allowing the user to type in the details of what exactly is wrong. Using the phone’s camera, photographs can also be taken of damage or faulty parts, for instance, which can then be sent along with the results of the check to the back office. There is a light bulb symbol on the top right corner of the screen, which when pressed turns the phone’s torch on, good for when it is dark and checking things like tyres. But couldn’t a driver just tick all of the boxes as ‘pass’ without even getting out of his seat and looking at the vehicle? No, CheckedSafe has included a ‘compass’ function in the app that uses the phone’s GPS to track the driver actually walking around the vehicle. ‘As you can imagine, that makes it very difficult to cheat the system,’ said Gary. Fully secure servers are used by CheckedSafe to ensure all data saved on it is safe. 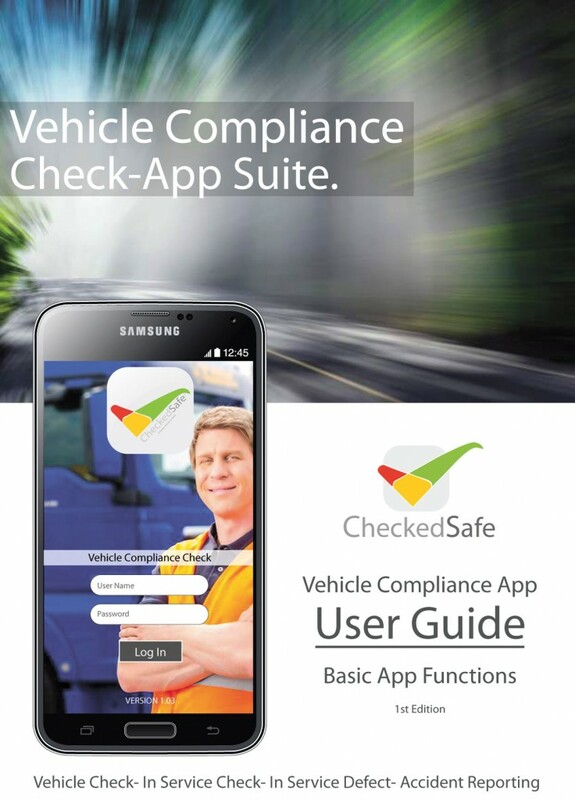 CheckedSafe can even be configured so drivers have to take photos of themselves as part of the check, which can be used to ensure the uniform is correct and that it is the right person doing the report. Customisations like this are relatively easy for the company to implement for customers, it being able to ‘flip over something like this in an hour’. A voice to text function can also be added for defect reporting. ‘Flexible’ was how Gary described the structure of the app, saying, ‘We can put any template on it’. For instance, based around the same basic structure as the walk around check app, an accident reporting aid has been developed. Designed to be similar to the format of an insurance ‘bump card’, it features questions for drivers that can be tailored to a company’s individual requirements. It will then lead the driver through the firm’s own process for dealing with accidents. A benefit of it is that it can speed up reporting such incidents. This means insurance companies can be informed sooner, which is good news for those looking to save on claims costs. Gary said he has received some interest from the insurance industry because of this. The CheckedSafe driver walk around check app. Users go through the walk around check list, pressing pass or fail. There is even a CheckedSafe lone worker app, which uses GPS for tracking staff who are required to check in on a regular basis to ensure their safety. It is designed to help look after those working in potentially dangerous situations on their own, such as night bus drivers. With the walk around check app, sending the information over to the back office straight after the check is done means an evening’s workload in the workshop can be planned more efficiently, rather than waiting for vehicles to return to the depot with their vehicle defect forms before knowing what work needs doing that night. 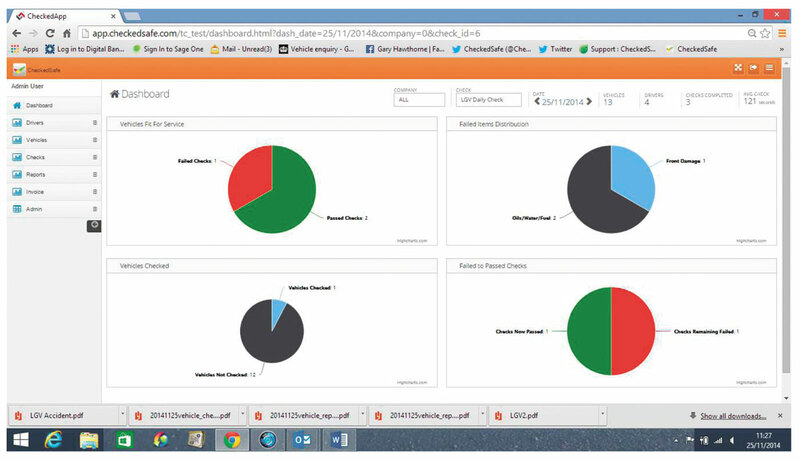 A software package is available, which provides a dashboard for viewing data collected through the checks. It features graphs showing vehicles fit for service, any failures and a host of other information, which can be drilled down into for more in depth details. It is designed to give an audit of the state of the fleet. Another benefit of using this system is it saves money, Gary claims. We worked out that it cost £1.50 to £2 per vehicle to do walk around checks using paper, ‘That’s without chasing the missing ones and working out who’s name is the squiggle,’ said Gary. However, the CheckedSafe way costs £1 a week per vehicle regardless of how many checks are made. Being a former operator with 109 employees, Gary knows how much of a benefit this should be. Gary’s move from operating to creating this app took place three years ago. It was after he met solicitor Darran Harris, who processed the sale of Gary’s bus operation. Gary had set up a Transport Consultancy specialising in operator compliance and transport management, he asked Darran to help out when one of his clients was called before the Traffic Commissioner. The problem here was walk around checks, specifically, not doing them correctly. Talking to Darran, It was obvious that this was one of the most common reasons operators are summoned before the Traffic Commissioner. From his own experiences, Gary knew that not being able to track whether a driver has actually carried out the inspection correctly was a real challenge. He was aware there were already ‘bits of apps’ around that can do similar things, but they both knew they could do something more. Details of the failure can be added for each section. Having mapped out the idea and how it would work with Darran, They got some IT specialists involved with its design. It took 12 months to develop, including initial testing. Originally, the app was released on Android smartphones and mobile devices, then later on Apple. Gary said it combines his 25 years worth of experience in operating fleets and Darran’s legal insight. Darran had over 20 years of dealing with the haulage industry in terms of accident management and had worked with one of the largest hauliers in the UK, so from that perspective Darran and Gary are a perfect match bring two very good skill sets together and a wealth of knowledge and this is where CheckedSafe differs from software companies. 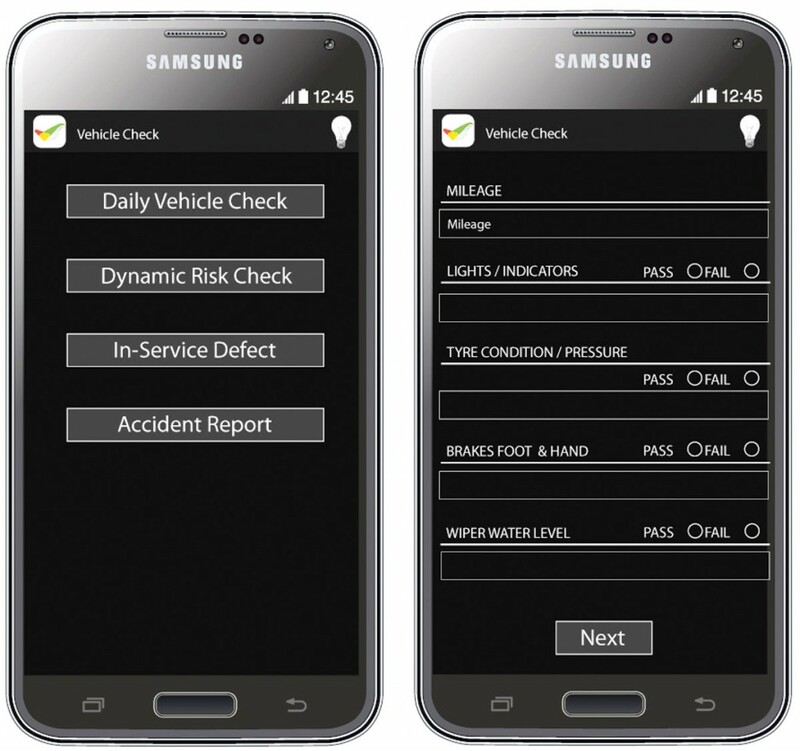 So that operators can see for themselves the benefits of this combination of expertise, a free 30 day trial of CheckedSafe is available, allowing them to get to grips with the app. Gary said 95% of people that go for this trial end up buying it, some of them before their trial ends. One possible barrier to it being further rolled out would be that even though Gary says there is an estimated 85m smartphones in the UK, not everyone has one. This does not have to be an issue though, he believes, as he has a business partner who can provide smartphones for as little as £3.50 a month. If drivers are using their own phone to use the app, then they can be rest assured it will not take up too much of its memory. It only stores details of the last check made and Gary said it uses less data than an email. Also, if there is no signal, then the app will hold the details until it is able to send the message. Data sent over to the back office can be easily integrated with other systems, with the information being totally open platform. Gary said he is talking to telematics and ticket machine companies concerning this, with a view to integrating the data with their solutions. In terms of future developments and uptake of customers, Gary said the company is now getting to a ‘tipping point’. He has recently taken on three more full time employees to help cope with the developing business.